It does my heart good to see the three of you together, I think you have found an amazing boy to help you carry on Jerry’s “leg”acy!! Paris and I send you a lick and a hug! Wow-Wow! You are one beautiful pup! Glad to have you as our spokespup. Have a good, wonderful life on Jerry’s Acres! This is so wonderful for all of you! Welcome Wyatt Ray Dawg, you’re going to LOVE your new home and family, they’re awesome!!!!! Hey, it’s been a very long time coming for you to come into your pawrents lives… so I’m happy for you all. Pogi and I say Howdy, Wyatt and welcome!!! what a cutie! Once again, this gave me goosebumps and just the most incredible feeling of joy, love (and sorrow in missing my shepherds). I too have a new rescue. Though I have never had a tripawd dog, both of my German Shepherds ended up crippled due to hip problems so I have felt the pain of dealing with that part. I think you are incredible people and I’m so warmed by your story. Have fun with Wyatt Ray Dawg!! He looks like he has such a cute personality. Gosh, I know he feels as if he was lifted from Hell and brought into Heaven when he went from the bad place he was into your lives. Bless you both. Have a wonderful day and have fun. Life is sure too short not to!! Lisa, thank you for watching my movie. I hope we and your pack get to meet sometime! Yeah, Spirit Jerry had bad hips too. My pawrents are hoping that I don’t because I don’t have any more spare legs! Nice to meet you Mr Wyatt Ray. I am so happy for all of you that you found each other. It angers me because of the way you found him but in the end the main thing is that wyatt will never suffer that torment again. We got ourselves a puppy (toy poodle) since saying goodbye to our flipster. We know he cant and wont replace flip but, yes, he fills the void in our life. He is a mini me of flip, very sweet, and my shadow, lol, and that makes me happy. Thank you everyone for sharing your thoughts and prayers with me with the loss of our dog. I would like to share a poem with you. As I said originally, and continue to say, Wyatt is one handsome boy…I know he will continue to carry on the important message that Jerry spread around the world…that tripawds are awesome and are a beloved part of their pawrents’ lives! Very beautiful site and wonderful dog!!! 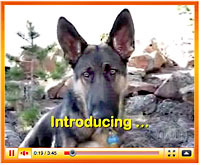 I’ll share your site on my page in facebook for sensitize adoption of tripawds dogs and cats. I’ll share your site on my page in facebook (https://www.facebook.com/AmoreA3Zampe3LegsLoveTripodi?fref=ts) for sensitize adoption of tripawds dogs and cats. Thank you for watching the video Sara! We love the work you are doing in Italy, thank you so much for being there for the animals. Super to meet you Mr Wyatt Ray Dawg! What a beautiful pup you are! You guys are all amazing. What a great way to continue on with Jerry’s ‘Leg’acy! Very cute! I can’t say thank you enough for your commitment to Tripawds everywhere! Stewie will be very impressed when I show him your website! Paw shucks Stewie and co., you guys are the coolest! Tell Stewie to get well soon, I wanna play! I actually cried watching this and hearing about how you brought this beautiful, amazing new guy into your life. He’s a lucky dawg, and you are lucky too! Love balances so well on three legs, doesn’t it? Oh Nina, it is so good to hear from you. Thank you for watching our video, I’m glad you liked it. Please stop by our forums and update us on things. You are in our hearts, always.